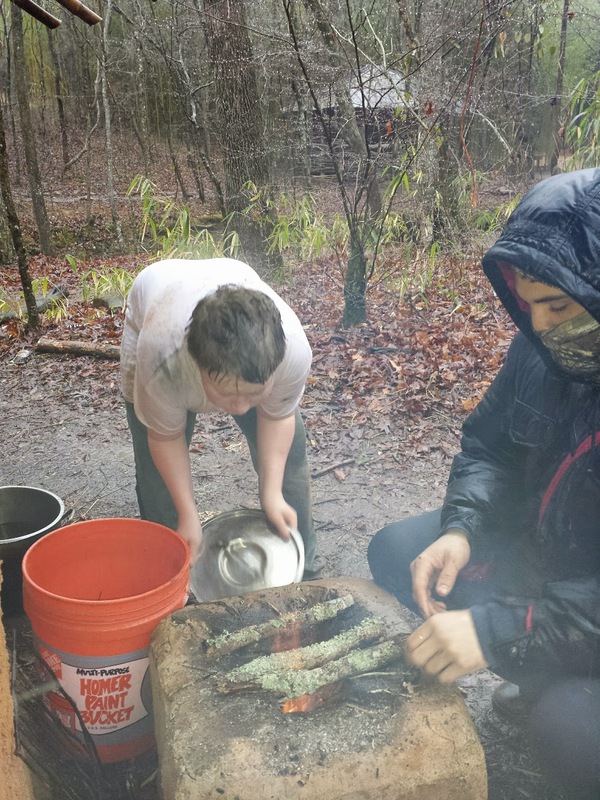 As many are prone to do at this time of year, we look back at 2015 in the life of Troop 50. The scouts reached new levels for advancement, enjoyed a diverse camping experience, and continued our tradition of service to the community. We also bid farewell to a good leader and friend of the troop who passed away this summer. Through the highs and the lows of the year, the troop worked hard to fulfill our mission to GATHER young men into a quality scouting program, GROW them into servant leaders, and GO into the community in service and fellowship. The troop at Camp Sequoyah. Our camping program saw a collective 337 nights of camping by the scouts and adult leaders of the troop. These included nights spent underground at Cumberland Caverns, in the international village at SIFAT, aboard the USS Alabama for a shipboard adventure, in the backcountry of Providence Canyon, and in the mountains of North Carolina on our rafting trip. We also spent a great week at Camp Sequoyah for summer camp and on the ski slopes of Gatlinburg in January. One of the most highly rated trips by the patrol leaders' council was the trip to SIFAT. Despite the rain, the experience was eye-opening in multiple ways. The scouts learned about the cultures of various developing countries and learned that having adequate food is not something we should take for granted. It made us appreciate all that we have in our society. fix a meal with limited resources at SIFAT. The year set a record for advancement with a total of forty-four ranks and 118 merit badges earned. We had an 81.5 percent advancement rate this year as twenty-two of our twenty-seven scouts advanced in rank, with several advancing through multiple ranks. 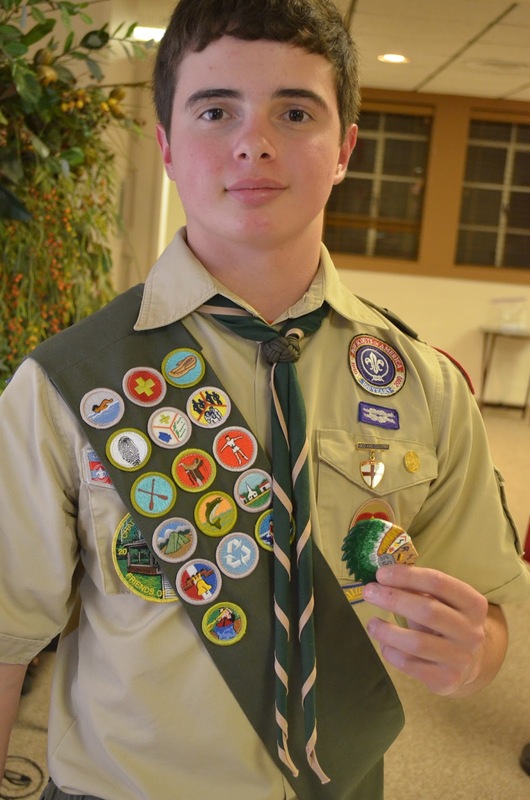 Although most of the scouts earned multiple merit badges, Creighton led the way by earning thirteen this year. Liam was close behind with eleven and Nicky earned ten. 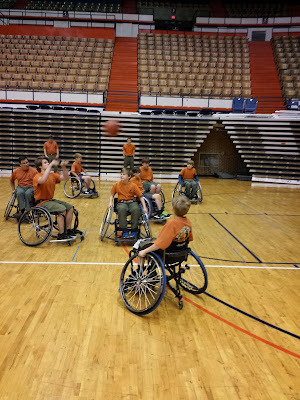 Our advancement program included the first troop merit badge day in December, a disabilities awareness program on the Auburn campus in April, and various rank requirements that were covered during campouts. We also celebrated the advancement of three more scouts to Eagle as Andrew Stanford, Robert Perry, and Will Pendleton added their names to the troop's Eagle's Nest. The coming year may prove equally prosperous for Eagles as we have three more scouts who are in various stages with their Eagle Projects. learning about people with disabilities. Our commitment to community service included our first joint project with our chartering organization, the Auburn Rotary Club. During Mulch Madness in March, the troop helped spread several cubic yards of mulch around Hickory Dickory Park. We also continued our annual service at the Blast and Cast to benefit veteran's scholarships and the Kevin Bell Memorial Scholarship. Other troop service projects included sorting food at the East Alabama Food Bank during the Saugahatchee District's Scouting for Food program, gathering compost material at SIFAT, picking up trash at Chewacla State Park, a conservation project at Camp Sequoyah, and our annual toy collection for Toys for Tots at Christmas. 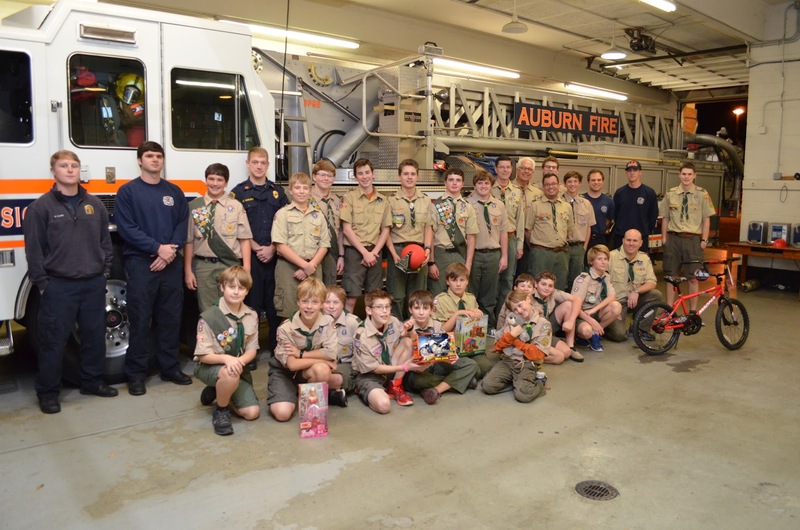 Several scouts served individually at the District Cub Scout Day Camp and at the National Night Out program sponsored by the Auburn Police Department. With three Eagle projects also among the service opportunities, Troop 50 scouts and leaders collectively contributed 766 hours of service. It was an effort certainly worthy of pride by our scouts. 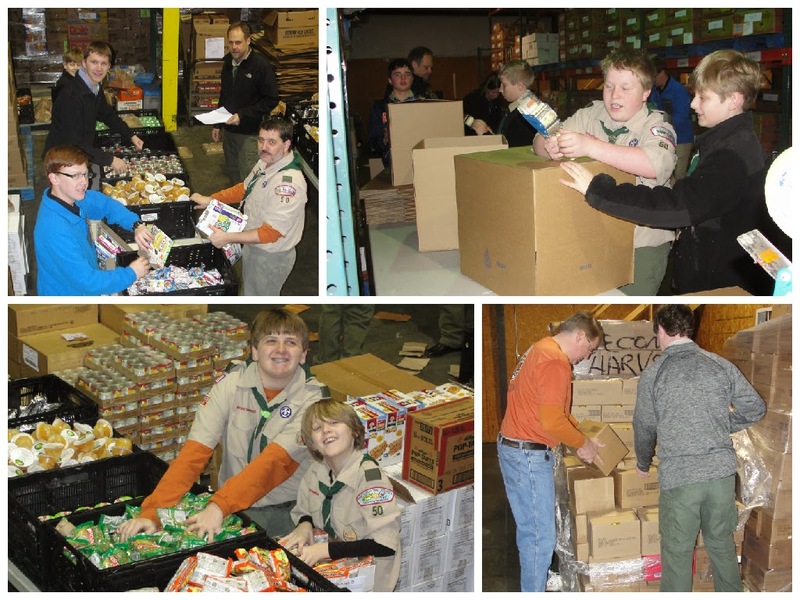 Troop members sort food at the East Alabama Food Bank. Along with the highlights this year we also faced the sorrow of losing a strong supporter of the troop when John Cottier passed away suddenly at the end of June. John was officially an assistant scoutmaster with the troop but he was one who worked behind the scenes taking photos, helping set up for events, and encouraging the efforts of all around him. The troop attended his funeral as a unit, honoring his memory and helping to celebrate his life. We will long be blessed by his example to us. John tells the scouts about archeology efforts at Horseshoe Bend National Battlefield. Another milestone was reached this year with the May election of Louie as senior patrol leader of the troop. Louie was the first SPL to have joined the troop from a Cub Scout pack and have advanced through the ranks to this position. All of our previous senior patrol leaders had joined the troop when it was founded in 2012 by transferring from other troops. This point marked a transition in the life of the troop. As part of this transition, we held our first Introduction to Leadership Skills for Troops training in the spring. In recognition of the fine work of the previous SPL, the scouts honored Andrew Stanford as the first recipient of the James J. Baird, Jr. Honor Scout Award at the June Court of Honor. The award was based on criteria such as advancement and participation as well as a peer ranking by his fellow scouts. Louie poses with his SPL neckerchief slide. along with members of the Baird family. Our final event of 2015 was the Court of Honor and Christmas Party on December 14. Over eighty scouts and family members attended to honor the hard work of the troop. We awarded twenty-five merit badges and fifteen rank advancements. New youth leadership was sworn into office as Nicky took the reigns as the new SPL with Josh as his assistant. Everett and Jason assumed their roles as the patrol leaders of the new Eagle and Mountaineer patrols with Joe and Ethan as their assistants, respectively. 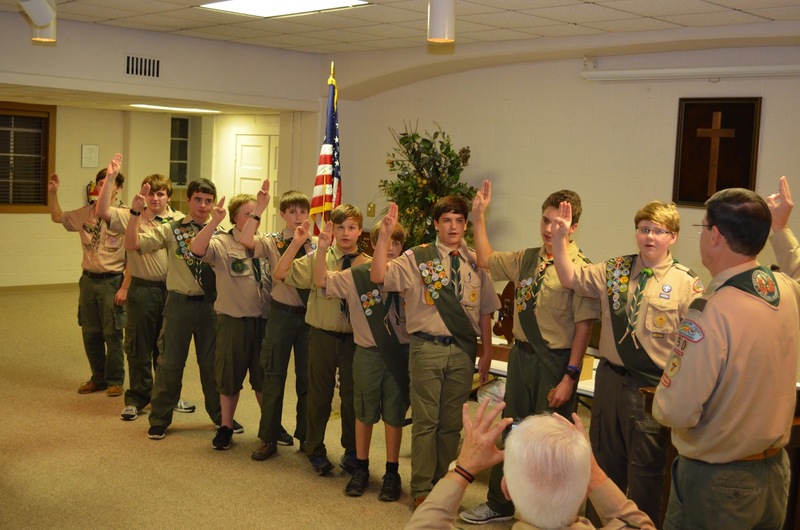 A new program staff was created to plan and provide instruction at the troop meetings. Louie will head this new endeavor as the lead troop guide with Creighton as his assistant and Michael as the new lead instructor. More photos from the event are found in the online photo gallery. New youth leadership is sworn in at the Court of Honor. Following a raucous game of dirty Santa, which included some very nice gifts this year, we loaded up the collected toys and headed for Auburn Fire Station 1. 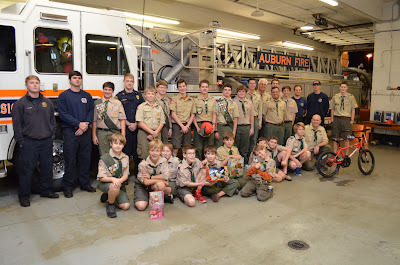 The Toys for Tots collection by the Auburn Public Safety Department has become an annual service project for the troop. It was a fitting way to cap off the year. in support of the annual Toys for Tots service project. Not only does the troop have much to be proud of, we have much to look forward to in 2016. Our scouts have worked hard to make this an excellent program. The strong commitment of our parents and adult volunteers have also made this possible, along with the support of the Auburn Rotary Club and the First Presbyterian Church. Everyone working together for the good of the troop is what makes this work.